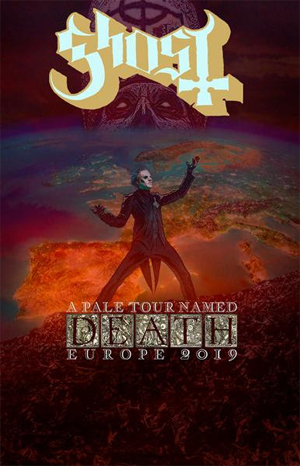 Armed with three Swedish Grammis Awards, a U.S. Grammy, and 75-million global streams of its latest album Prequelle, GHOST announces the European leg of its "A Pale Tour Named Death" world tour, the band's first set of 2019 concert dates, that will start on February 3 in Lyon, France. Ticket presales begin this Thursday, September 13 at 10AM CET, and the general on sale will start Friday, September 14 at 10AM CET. Complete dates are below; log on to http://bit.ly/GHOSTVIP for all ticketing details. For these European dates, a limited number of VIP Cardinal Copia Upgrade Packages have just been made available. The special packages include early entry to the venue, a pre-show photo op with the Cardinal, a GHOST alter candle, a GHOST mystery puzzle and other exclusive perks. Go to http://bit.ly/GHOSTVIP for all details. GHOST's 2018 Fall tour schedule began with a sold-out headline concert at London's prestigious Royal Albert Hall on September 9. The band heads to North America for its 40-date headline tour that starts October 25. That run will include two arena performances, November 16 at the Los Angeles Forum, and December 15 at Barclays Center in Brooklyn. In addition, a limited number of GA floor seats for both the Los Angeles and New York arena dates have just been released. They will be available for purchase today at 10AM local time. GHOST's complete 2018 Fall dates are accessible HERE. It's already been quite a year for the Swedish rock band. In addition to the early global success of Prequelle, "Rats", the album's first single, has accumulated more than 25-million streams, set a 2018 record for maintaining the #1 spot at U.S. Rock Radio for nine consecutive weeks, and the track's companion video has logged north of 12-million YouTube views. Last month, GHOST released the provocative Carpenter Brut remix of one of Prequelle's most popular tracks, "Dance Macabre" that crossed the band into the world of dance music.